These dairy-free truffles taste great without added fat and sugar. Great as a gift to family, friends or coworkers. Pulse in cocoa powder until solid dough forms. Stir in puffed brown rice. With small scoop, form mixture into 14 Tablespoon-sized balls. 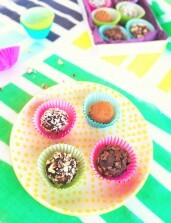 Roll each ball into coconut, walnuts, cocoa powder, or nibs to lightly coat. Refrigerate for 30-60 minutes to set.